Ok ok, I know. It’s been 2 months since my last post! Talk about leaving you hanging! Well I promise you there is good reason for my silence. First off, let’s talk about this silly thing called a thyroid. Well I somehow went from having a slightly over active thyroid to a slightly under active thyroid. I tell ya, I seriously keep my doctors on their toes! Never a dull moment with me. So they have put me on Levothyroxine or synthroid which is basically a synthetic form of the thyroid hormone my body produces. Which brings me to the reason for my silence. You see, I was preparing for that radioactive thyroid uptake scan i was telling you about at the end of May so they could more accurately diagnose my thyroid issue. Of course I was reading about side effects and all, with nothing too much concerning me. Biggest no no is being pregnant as the radioactive dye is highly toxic to the baby. No worries there. I just had my first period since treatment began like the other week. No wait, when was it again? Oh it was last month. Ok, so it’s due umm, umm, oh umm (check my calendar) it’s due yesterday. Yesterday? So take the test to be sure I’m good. I mean abnormal cycles after everything I’ve gone through are super common. SURPRISE!!!!!!!!!!!!! Looks like those doctors appointments will continue and probably multiple! And yes that’s right. One test wasn’t enough. I was in such shock, I had to take all three just to be sure! Holy sh*t! We are going to have a baby! Is this really happening??? Of course at this point I actually remember to call and cancel my scan. I was so happy and thankful that I found this out prior to having the scan done. That just would have been awful! Now as you can imagine the incredibly massive wave of emotions hits and I’m all over the place. Is it too soon? Are my doctors going to scold me? How viable are my eggs given the treatment I’ve just endured? OMG, we did it! Naturally too! This is a miracle! Don’t get too excited. It’s still so early. But I want to tell everyone! We should wait. But these are the people that are my support and if by chance things go south, they will be my up lifters. Ugggg those first few days and weeks were tough. And I so wanted to shout from the rooftops that we are pregnant. But after discussing it, we decided to wait until the first trimester was over and until we saw our high risk doctor. I have to apologize for my absence over the last two months. You see, I have ZERO poker face through my blog or in person. The news is just so damn exciting that I knew if I tried to post results from my thyroid or anything else, I would totally blow it. So I remained silent. However, that’s all over now. I plan on blogging every little bit about my pregnancy. Miracles do happen. I’m living, breathing, walking, talking proof of that. 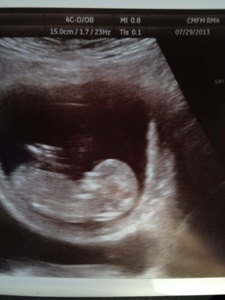 And so is this sweet little bundle of unimaginable joy that I’m carrying. We’ve been through absolute hell and made it out on the other side. From being pregnant, to preterm labor at 24 1/2 weeks, to 9 days in the NICU, to holding our sweet Cameron as he passed, to breast cancer,surgery, fertility preservation, treatment, recovery, and now full circle to getting pregnant on our own. The only word that comes to mind is BLESSED. I think that this chapter in my ongoing story may be the most important yet. It will be one of hope. A message to everyone to never give up. Miracles happen. Next up is my pre-op appointment on the 8th as I will have surgery on the 19th for a cervical cerclage. This will help support my cervix and hopefully get us to full term. I will also have weekly progesterone shots starting that week to assist in keeping contractions at bay. Our doctor explained to me that in classic cases of incompetent cervix, woman typically efface and dilate with no warning and no contractions and usually around 17-18 weeks but does occur further along in pregnancy. This is usually because the cervix doesn’t function properly due to surgical procedures or multiple abortions. Unexplained preterm labor presents with contractions and then effacing and dilation. This can occur in woman who have a weak cervix so to speak where the weight and pressure cause it to thin. So they feel the best course of action is to do the cerclage to strengthen and progesterone shots. Both are highly effective if done prior to complications arising. (This has been your medical lesson for today! Lol) The shots can be administered by myself or at the office or even by a home service. My doctor felt in my case, given everything that we’ve been through, coming to the office weekly would be the best way. They will be able to keep a close eye on me and this will help keep the worrying down. Funny thing is, I feel like I’m in such amazing hands that I’m not worrying. We have already been through tough times. This is the light. And I know these doctors are going to do everything they can for us. The time for worry is over! This entry was posted in Breast Cancer, cancer and fertility, Healing, Recovery, Treatment and tagged breast cancer, cancer miracles, Infertility, thyroid issues by surviveber. Bookmark the permalink. Amber- I always read your posts and couldn’t help but smile reading this today. I am so happy for you and the family. Absolutely heartwarming. Jason and I send our sincere congratulations and prayers for a smooth pregnancy. What a miracle! I’m excited for you guys and pray for a safe pregnancy for you and the little blessing!